The unique nature of Alwun House as an arts center and gathering place for cultural and social events is that it brings together both the artistic communities and the community at large. The primary neighborhood-resident experience will be one of a “pocket park,” meeting neighbors out walking the dog, shaded seating and sculpture garden, a coffee cart, a peaceful respite under blooming trees and vegetation. The park is to be planted with a large variety of desert appropriate trees, vines and shrubs to celebrate the diversity within our urban desert community and neighborhood. We envision green lush gardens, shaded open space for community gatherings, art installations, performances, workshops, festivals, health fairs, food trucks, artists and vendors. 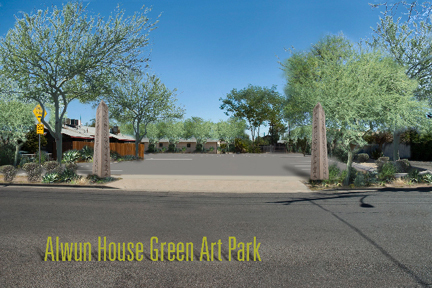 Our sustainable Green Art Park community enhancement project, doubles our existing facility by developing adjacent vacant lots acquired by Alwun House, into a one-of-a-kind community gathering place, with its unique custom zoning overlay. First, Alwun House made sure the property could be legally used for these lofty arty dreams of multi-purpose activities. Attorneys at Gammage and Burnham seeing the importance of our vision, helped with purchase contracts and the rezoning process. With their pro bono assistance, and strong Garfield neighborhood community support, and unanimous Committee and City Council approval, Alwun House created Phoenix’s second custom PUD (Planned Unit Development) zoning since the City created the code. This custom personalized zoning enables the park, to provide parking and/or the open space could be used for a multiplicity of uses open space for special events. We are permitted stage, artisans selling wares, food trucks and many other specific uses. The property may host community gatherings and neighborhood yard sales. Also the park can host outdoor workshops and classes, such as pottery, raku firing, sculpture fabrication workshops, yoga and thai chi classes, and a community garden. These and other collaborative programs will bring in a new community educational component to further transform our community, going way beyond a simple parking lot. The need and community support for this project is demonstrated by the strong Garfield neighborhood support and City Council’s unanimous approval establishing an official City Ordinance “The Alwun House PUD.” These supporters know that this Green Art Park project will invigorate our entire neighborhood. A simply pledge to buy one brick, a $100 brick (installments available), with your name etched on it, leaves a legacy showing support for your trailblazing art house. You can be original, consider memorializing one you love; a parent, artist, or pet. Start with a $100 brick on the Garden Path. Pledges may be upgraded over this two year capital campaign with such “signature” options as $500 leaf, $1,000 tree memorial. We’re open to in-kind contributions; make us a proposal – this park will be your sandbox too. Your investment in this sustainable expansion project, adds to your legacy as well. It’s time for your voice to be heard. Special thanks to Gammage and Burnham for donating their services, assisting Alwun House with purchase contracts and rezoning. Thanks also goes to Paul Miluski of Project Engineering Consultants who donated a technical land survey of the site. Special thanks to the following professional designers. *donating their professional assistance pro bono – THANK YOU! Donating $100 might sound like a lot of money, but spread over a little time in installments, it really isn’t. I recently pledged $500. I use my B of A online billpay, and have $25 deducted every payday when my direct deposit goes in. I have already paid $100 toward that pledge and didn’t even notice it! It’s certainly for a good cause, and the plaque that I get for this will be there for a long time after I am gone. My kids know that I love the arts, and what a cool thing for them to show my grandchildren someday! If you haven’t experienced the Alwun House, you are in for a pleasant surprise. I try to attend every exhibit and every show. Three is something for everyone.